VANCOUVER, BC – Five breweries located in an area of Vancouver once known as Brewery Creek have released a new collaborative beer to commemorate the currently underway BC Craft Beer Month. Brewed at R&B Brewing with the participation of brewers from 33 Acres Brewing, Brassneck Brewing, Main Street Brewing and Red Truck Beer, the 3.9% abv Spruce Tip Stout debuted last weekend at the BC Beer Awards, and is now available in a limited run of 650 ml bottles featuring a unique embroidered patch as the label. 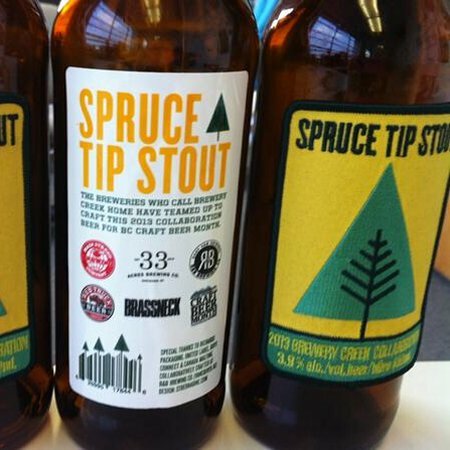 Spruce Tip Stout is available now at select private liquor stores in Vancouver and surrounding area while supplies last.